Add Internet permission to AndroidManifest.xml file. 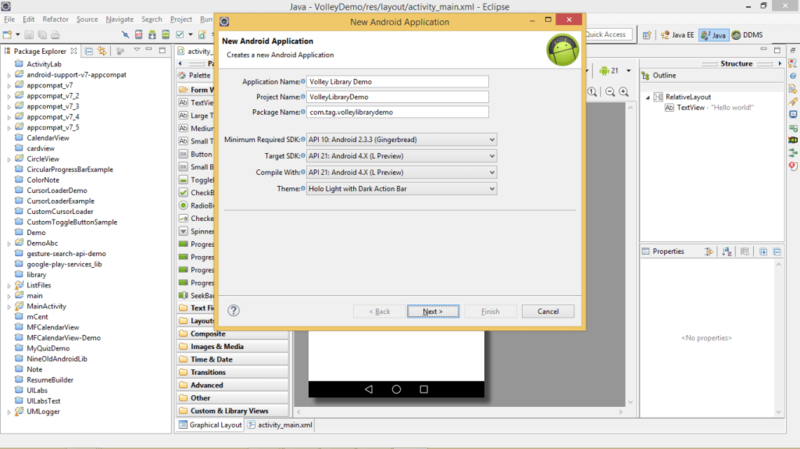 we will learn how to setup Volley for Android and write a sample code to make a JSON request. Android Volley library is introduced to save time and efforts of all the developers who are tired of writing tones of code for communicating over a network. It is introduced by google to make network calls easier and most importantly much faster than usual calls. As in old methods to communicate in asynchronous manner developers need to use AsyncTask but in volley library all the calls will be asynchronous by default So, now no more AsyncTask required to communicate over network. Now we will learn how to setup volley library. Git It is used to clone git repository into workspace. You can download it from here. Install it. Apache Ant It is a command-line tool used to build the source code. Download it from Apache Ant and add the bin path to environmental variables. You should able to execute ant command too in terminal. 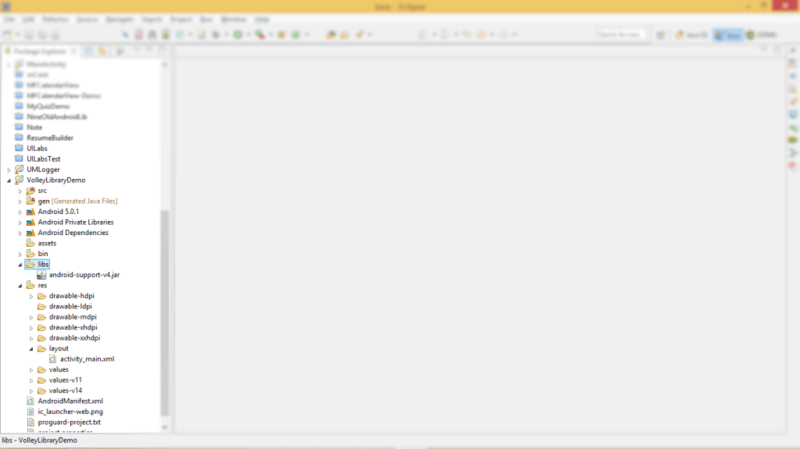 Now you can use the volley as library or you can make .jar file of it. For that navigate to volley library folder and type this two command. 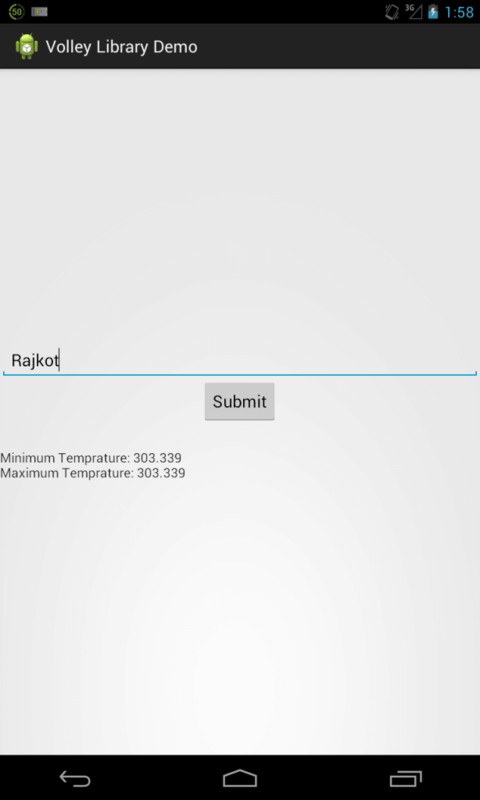 Here we will make an demo app in which city temperature will be displayed. Create new project. Copy volley.jar file and paste it into folder. In volley there is a class called RequestQueue. By using this library we can create call queue and also prioritize it. RequestQueue will make call to the JSON URL or API according to objects in queue. StringRequest Specify a URL and receive a raw string in response. See Setting up a Request Queue for an example. ImageRequest Specify a URL and receive an image in response. JsonObjectRequest and JsonArrayRequest (both subclasses of JsonRequest) Specify a URL and get a JSON object or array (respectively) in response. String temprature = "Minimum Temprature: "
Here onResponse() is used to get response from API or JSON URL and if any error is generated onErrorResponse() is called. After creating JsonObjectRequest object add it to RequestQueue. 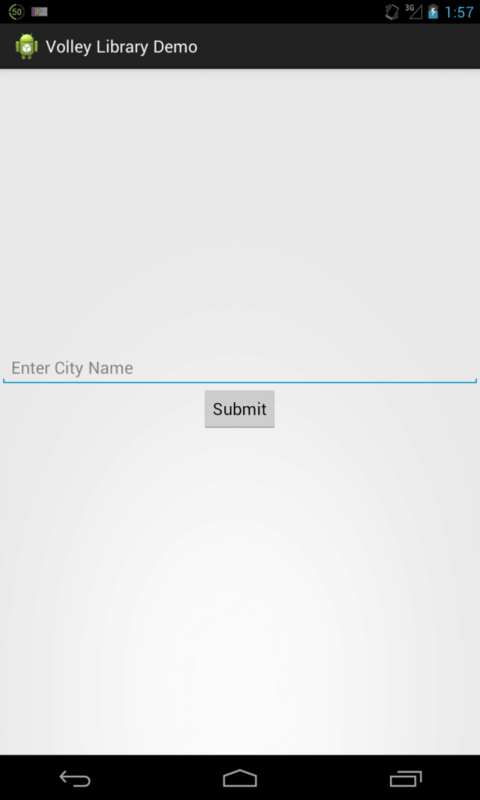 Step 6 Run application and enter city name. I hope you find this blog very helpful while working with Volley. Let me know in comment if you have any questions regarding Networking for Android. I will reply you ASAP. I am dedicated and very enthusiastic Android developer. 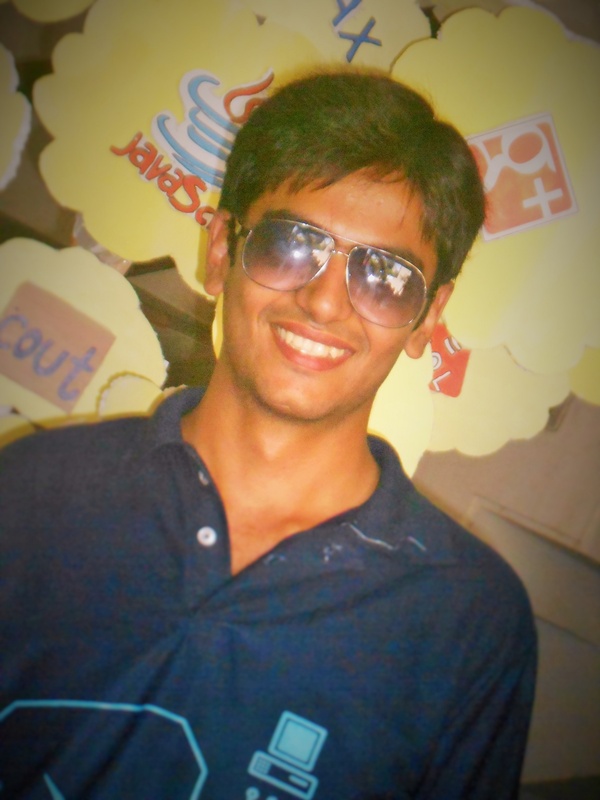 I love to develop unique and creative apps and also like to learn new programing languages and technology.